Born in Leszno, Poznan, Poland, to Benno Fraenkel and Alwine Taendler, little is known about Heinrich Fraenkel’s early life. His obituary, which appeared in The Times newspaper (28 May 1986), states that “Fraenkel as a schoolboy was by chance in Britain when war was declared”, but whatever the circumstances of his presence in England he was arrested and imprisoned in Isle of Man at the outbreak of the war. 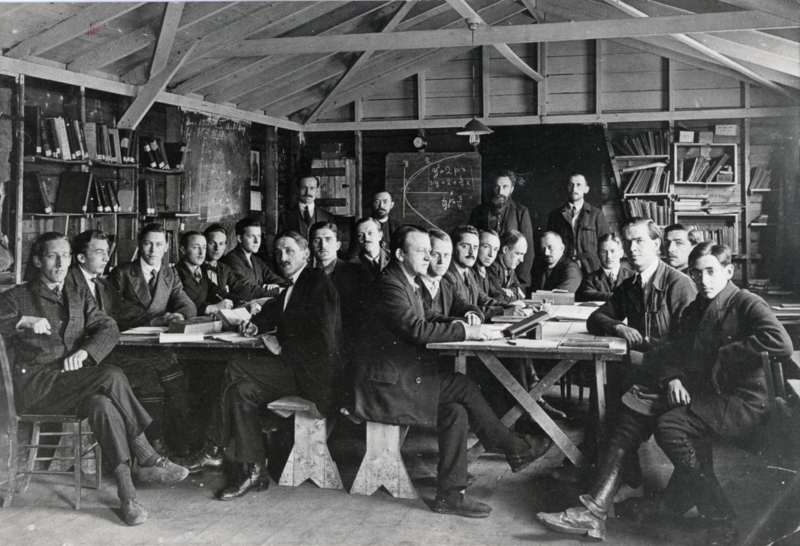 His time in Knockaloe was well spent, as part of Professor Albers' Abitur class he passed exams and acquired a strong command of the English language (see picture below, Fraenkal is shown on the far right). 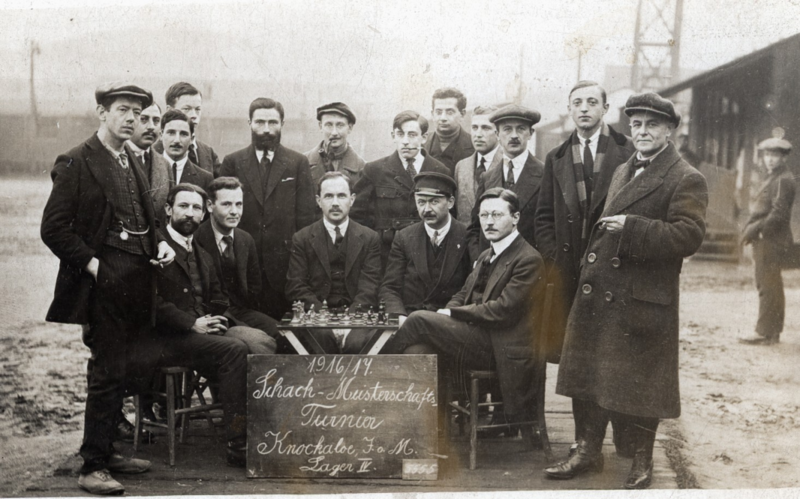 He was also an enthusiastic chess player, competeing in the camp’s Chess Tournament (see picture right, Fraenkel is pictures in the centre smoking). The game would later become a significant side project in his career writing a column and several books on the game. After the cessation of hostilities he was repatriated to Germany where he studied at several leading universities becoming a journalist, writer and screen writer. At some point in the 1920s he returned to England from where travelled aboard the SS Tuscania to New York (1929), and then onward to Los Angeles. During his time in America he certainly worked at Metro-Goldwyn-Mayer Studios, California on the script for the Jacques Feyder film, Olympia (1930); a German adaption of Lionel Barrymore's film His Glorious Night (1929), based on Ferenc Molnár play Olympia (1928). He also worked with the highly acclaimed director Wilhelm Dieterle, at Warner Bros studios, on the German language film Die heilige Flamme (1931). His stay in America was short-lived as he returned to England in November 1931 aboard the Albert Ballin. The address given in the incoming passenger lists, as c/o British and Dominions Film Ltd., Elstree, Middlesex, suggest that Fraenkel had returned to England for work, and he is certainly credited for his work as a screen writer for the British films Youthful Folly (1934) and Menace (1934). Fraenkel returned to Germany for a brief period in 1932/33, but fled back to England after friends warned him he was on a Nazi suspect list following the arson attack on the Reichstag building in Berlin (27th February 1933). He continued to work in the film industry, and is credited as a writer for, the mystery Juggernaut (1936), directed by Henry Edwards and staring Boris Karloff and Joan Wyndham. Certainly he was living in London in early 1936 when he married fellow German émigré, Gretel Levy-Ries. Shortly afterward he departed for Spain where he fought in the Spanish Civil War. As I look out at the pleasant background of Douglas town and bay. I am surrounded by a teeming crowd of fellow-internees, most of whom are restlessly pacing up and down the grounds or round and round the barbed-wire borders of our little realm (Help Us Germans to Beat the Nazis!, after Isle of Man Weekly Times, 26 April 1941, pp. 4). The book also gives a vivid portrayal of life in the camp, including biographies of some of the other internees. His other political writings included an edited collection of essays that examined the future of Germany following the cessation of hostilities (Germany's Road to Democracy: A Social Democrat, Communist, Liberal, Scientist, Woman, Pastor, Outline the Future Germany, 1943). …is my homeland. I am still devoted to it, I am still anxious to get there for a visit once or twice a year, but I no longer wish to live there. I decided, some years ago, to acquire British nationality. This is a factual statement, easily put into a sentence or two; but to attempt an explanation will take all of some fifty or sixty thousand words (Farewell to Germany). For a man these day’s to be neither an out-and-out fellow –traveller nor an out-and-out Red-baiter, is not quite easy… It is probably easiest in England, and that too many have been one of the reasons for my decision to make my home in England, for this is the land where some tolerance is for ever being practised and the tacit respect for other people’s opinions. Arguably his most famous works followed towards the end of his life when he produced a number of biographies of notable Nazi leaders including Goebbels (Doctor Goebbels: His Life and Death, 1960), Goering (Hermann Goering, 1962), Himmler (Heinrich Himmler, 1965), Hess (Hess: A Biography, 1971) and Hitler (Adolf Hitler: The Man and the Myth, 1978). 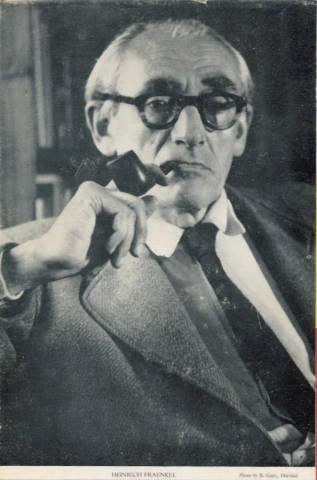 Alongside this he produced works on key events in the war including the July Plot: The Attempt in 1944 on Hitler's Life and the men behind it (1964) and The Canaris Conspiracy: The Secret Resistance to Hitler in the German Army, 1972). This work led him to be awarded the Order of Merit (First Class), by the Federal Republic of Germany, for his work on the Third Reich. He passed away on the 25th May, 1916 at the age of 88.